The Lockheed Warning Star is a member of the Constellation family of aircraft. It is fitted with a ventral and dorsal radar domes, and saw heavy use during the Cold War as a warning aircraft that detected if the Chinese Red Hordes ever came close or crossed the northern Atlantic and northern Pacific Oceans. As a warning aircraft, the Lockheed Warning Star was a proof-of-concept. Equipped with AN/APS-45 height finder radar on its back and AN/APS-20 air search radar on its belly, it proved that an aircraft could fly around with external radar. A technological leap forward during its time, the Warning Star was utilized by the US Navy and Air Force, with the latter using it up until the Vietnam War. The Lockheed Warning Star is an important part of aviation history. 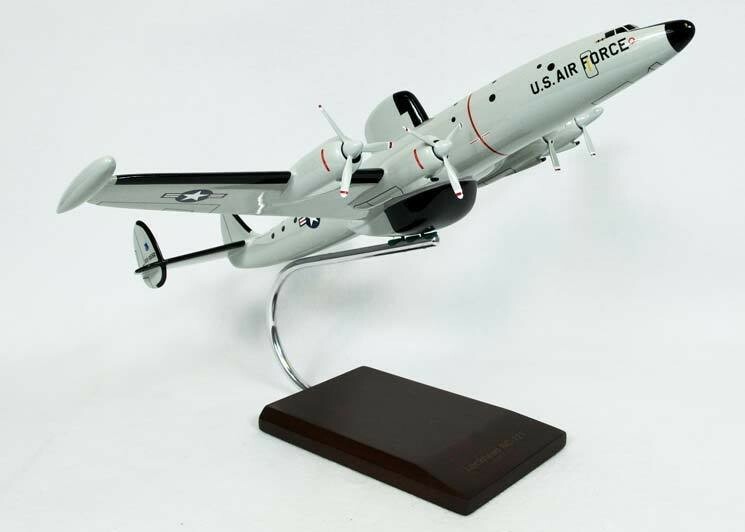 Helping the field of aircraft design move forward through its innovative features and technology, it is a significant addition to your desktop model aircraft collection. Its clean and high-tech looks give it a timeless beauty that is sure to be appreciated by whoever sees it. An exact replica of the original Warning Star, desktop model aircraft will blow you away.